Reserved Memory. This is the memory reserved by the system, and its size is hardcoded. As of Spark 1.6.0, its value is 300MB, which means that this 300MB of RAM does not participate in Spark memory region size calculations, and its size cannot be changed in any way without Spark recompilation or setting spark.testing.reservedMemory, which is not recommended as it is a testing parameter not intended to be used in production. Be aware, this memory is only called “reserved”, in fact it is not used by Spark in any way, but it sets the limit on what you can allocate for Spark usage. Even if you want to give all the Java Heap for Spark to cache your data, you won’t be able to do so as this “reserved” part would remain spare (not really spare, it would store lots of Spark internal objects). For your information, if you don’t give Spark executor at least 1.5 * Reserved Memory = 450MB heap, it will fail with “please use larger heap size” error message. User Memory. This is the memory pool that remains after the allocation of Spark Memory, and it is completely up to you to use it in a way you like. You can store your own data structures there that would be used in RDD transformations. For example, you can rewrite Spark aggregation by using mapPartitions transformation maintaining hash table for this aggregation to run, which would consume so called User Memory. 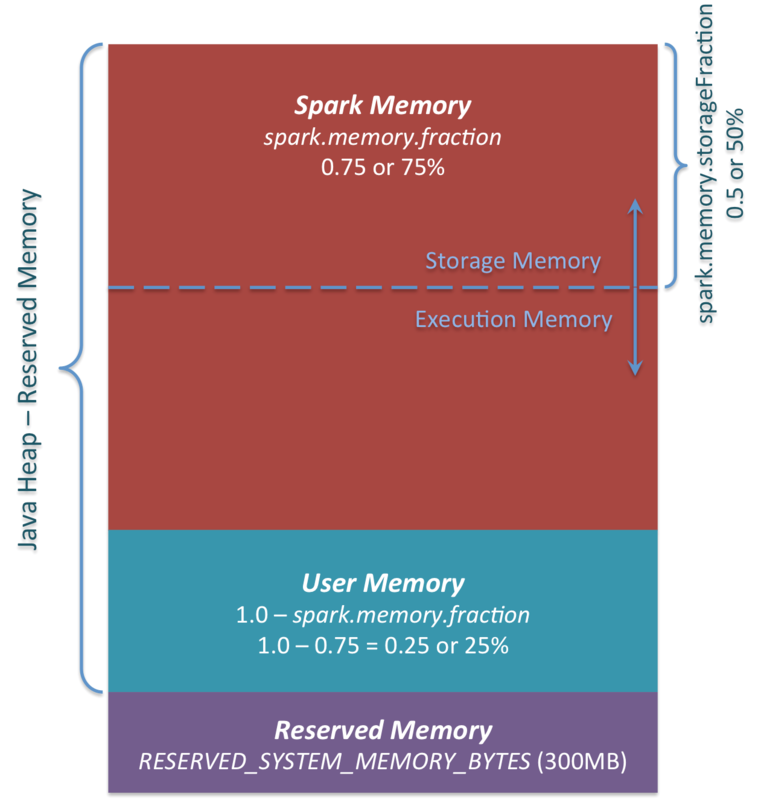 In Spark 1.6.0 the size of this memory pool can be calculated as (“Java Heap” – “Reserved Memory”) * (1.0 – spark.memory.fraction), which is by default equal to (“Java Heap” – 300MB) * 0.25. For example, with 4GB heap you would have 949MB of User Memory. And again, this is the User Memory and its completely up to you what would be stored in this RAM and how, Spark makes completely no accounting on what you do there and whether you respect this boundary or not. Not respecting this boundary in your code might cause OOM error. Storage Memory. This pool is used for both storing Apache Spark cached data and for temporary space serialized data “unroll”. Also all the “broadcast” variables are stored there as cached blocks. In case you’re curious, here’s the code of unroll. As you may see, it does not require that enough memory for unrolled block to be available – in case there is not enough memory to fit the whole unrolled partition it would directly put it to the drive if desired persistence level allows this. As of “broadcast”, all the broadcast variables are stored in cache with MEMORY_AND_DISK persistence level. Execution Memory. This pool is used for storing the objects required during the execution of Spark tasks. For example, it is used to store shuffle intermediate buffer on the Map side in memory, also it is used to store hash table for hash aggregation step. This pool also supports spilling on disk if not enough memory is available, but the blocks from this pool cannot be forcefully evicted by other threads (tasks). Ok, so now let’s focus on the moving boundary between Storage Memory and Execution Memory. Due to nature of Execution Memory, you cannot forcefully evict blocks from this pool, because this is the data used in intermediate computations and the process requiring this memory would simply fail if the block it refers to won’t be found. But it is not so for the Storage Memory – it is just a cache of blocks stored in RAM, and if we evict the block from there we can just update the block metadata reflecting the fact this block was evicted to HDD (or simply removed), and trying to access this block Spark would read it from HDD (or recalculate in case your persistence level does not allow to spill on HDD). There is free space available in Storage Memory pool, i.e. cached blocks don’t use all the memory available there. Then it just reduces the Storage Memory pool size, increasing the Execution Memory pool. Storage Memory pool size exceeds the initial Storage Memory region size and it has all this space utilized. This situation causes forceful eviction of the blocks from Storage Memory pool, unless it reaches its initial size. In turn, Storage Memory pool can borrow some space from Execution Memory pool only if there is some free space in Execution Memory pool available. Initial Storage Memory region size, as you might remember, is calculated as “Spark Memory” * spark.memory.storageFraction = (“Java Heap” – “Reserved Memory”) * spark.memory.fraction * spark.memory.storageFraction. With default values, this is equal to (“Java Heap” – 300MB) * 0.75 * 0.5 = (“Java Heap” – 300MB) * 0.375. For 4GB heap this would result in 1423.5MB of RAM in initial Storage Memory region. This implies that if we use Spark cache and the total amount of data cached on executor is at least the same as initial Storage Memory region size, we are guaranteed that storage region size would be at least as big as its initial size, because we won’t be able to evict the data from it making it smaller. However, if your Execution Memory region has grown beyond its initial size before you filled the Storage Memory region, you won’t be able to forcefully evict entries from Execution Memory, so you would end up with smaller Storage Memory region while execution holds its blocks in memory. I hope this article helped you better understand Apache Spark memory management principles and design your applications accordingly. If you have any questions, feel free to ask them in comments. Thanks for the very detailed article! It will be very helpful when using Spark. As a user, how do I know the current state of how memory is being used? For example, if I want to cache an RDD and I calculated that memory would be enough when allocating resources, how would I verify that my assumptions are still correct after the work I’ve done in the context? it was a very nice explanation !!! 2. is it possible to view the executor memory in spark web ui. Suppose if my memory is insufficient spark pushes data into hdd how will it move to other executors . My entire data should be in either RAM or hdd but can it be contained in two places ? When i am executing spark job after every task GC(Garbage collector) is calling and job is taking more time for execution.Is their any spark configuration which can avoid this scenario. Do we need to tweak our spark jobs again for spark 1.6 ? With spark 1.6 the memory management is simplified , so the all other parameters(spark.storage.safetyFraction, shuffle.memory.fraction) effecting memory usage are of no use in spark 1.6? And does the shuffle works same as old with new changes? Can I borrow your picture of Unified Memory Manager in my slides? I will leave this link in my slides as reference! 3. Spark Memory — For example, with 4GB heap this pool would be 2847MB in size. should it be (4-0.3) * 0.75 = 2.775GB? Also in my own cluster, spark.executor.memory is set to 9G,but the executors in UI shows 0.0B / 6.2GB. I ran spark-shell on spark 1.6.0. I cannot figure out where 6.2GB come from, my calculation is (9-0.3) * 0.75 = 6.525. This is because the storage memory shown in web UI is maxHeapMemory – onHeapExecutionMemoryPool.memoryUsed, maxHeapMemory is (9-0.3) * 0.75 = 6.525, but since you’ve already used some memory for broadcase values such as jar files, so that the storage memory is smaller than the ideal value. You just saved half of my hairs! I wouldn’t figure out why giving 2GB of RAM and the executor just got nuked by OOM. It runs fine when I profile the mapPartitions function (even with only 1GB of heap) but fails in YARN mode. Thanks for sharing wonderful article and I think this is one of the nice article I have read about about Spark. However, can you please throw some lights how spark switching memory management from RAM to HDD and how this transition happened? what are the disadvantageous, performance overhead during this type of memory switching between RAM to HDD? Is RAM size could consider an issue or my code structure or nature of used data? how to reduce the execution time ?what goes wrong? Will you give me hints, guides? Thank you for the explanation! Do I interpret correctly: if I get OOM errors (heap space), that’s because the executor runs out of user memory, since both storage and execution memory can be spilled on disk? No. Storage memory will be spilled to disk only if you specified persistence level that allows storing the data on disk. If not, it will be just destroyed. Execution memory in turn cannot be forcefully spilled to disk, which I described in the article. Thanks again, that clarified it! I am seeing OOM errors (heap space) when running Spark on YARN. Could these be caused by the Java non-heap memory that is set using spark.yarn.executor/driver.memoryOverhead? I have similar issue. In my cluster, spark.executor.memory is set to 14G, the spark UI shows 9.8GB. I read an article before, it says:”This is because of the runtime overhead imposed by Scala, which is usually around 3-7%, more or less.” This seems apply to my calculation as (14*1024-300)*0.75*0.95=10001mb or 9.8GB. Thanks for excellent article. How do you measure execution memory region utilisation at runtime? For storage region this information is available on the Spark UI and also exposed via JMX. But I did not find any way to check memory utilisation for execution region. did you ever get an answer to this question? I too would like to be able to monitor the execution memory usage but have not found a solution. I am using spark on hadoop and want to know how SPARK allocates the virtual memory to executor/container. As per YARN vmem-pmem it gives 2.1 times virtual memory to container. Hence- If XMX is 1GB then –> 1 GB * 2.1 = 2.1 GB is allocated to the container. Total virtual memory = 1GB * 2.1 * spark.yarn.executor.memoryOverhead. Is this true? If not then please elaborate how virtual memory for an executor is calculated in SPARK. As per spark.apache.org/docs/latest/running-on-yarn.html executorMemory * 0.10, with minimum of 384. The question that I have is whether in case of SPARK, does YARN uses vmem-pmem (default 2.1) to calculate the virtual memory and then adds the overhead to that memory? I see contradictions of what you say about Storage Memory and what is written in Spark docs(https://spark.apache.org/docs/1.6.0/tuning.html#memory-management-overview). You say that “…this boundary is not static, and in case of memory pressure the boundary would be moved, i.e. one region would grow by borrowing space from another one”, which as I understand means that, for example, if I cached RDD and then a lot of shuffle happens, then cached data (stored in Storage Memory) will be evicted, and shuffle data will sit in that place. But Spark docs says: that “spark.memory.storageFraction expresses the size of R as a fraction of M (default 0.5). R is the storage space within M where cached blocks immune to being evicted by execution”, which as I understand says there is a region of storage memory that is unevictable. Finally, is there a region that is unevictable in Storage Memory or not? hi, i got a problem that i use the mapPartitions function heavily,but i dont known how to manage the memory in “user memory”,so i guest it accumulate data all the time,and finally the worker was killed by yarn because of “real memory use” > “core memory” + “yarn overhead” ,is there some solution or some useful doc? thx. Really nice overview! So where do memory errors (in Pyspark) potentially come from, if so many parts can spill to disk? A summary of this would be incredibly useful! 1) why the java process grows slowly to 5GB when I have only one map operation containing python code, which I assume is executed in the python worker processes? 2) Is there a way to achieve the desired memory limitation? I am wondering if setting spark.executor.memory=1GB and spark.executor.memoryOverhead=4GB will do the trick? 3) I assume that I have 4 python workers, because the executor is handling 4 partitions for each RDD. is this correct and is there a way to know how many python worker processes will be created for an executor? Quick question about the User memory: Lets say I define a custom mapPartitions functions and use a bunch of data structures in python. eg. heap or something. That heap should be allocated on the user memory right? Your article helped a lot to understand internals of SPARK. I am running Spark in standalone mode on my local machine with 16 GB RAM. I have configured spark with 4G Driver memory, 12 GB executor memory with 4 cores. According to calculation given in the article,storage memory should be (12*1024-300)*06*.5 = 3596.4 MB, But it shows 2.1 GB. Please help me understand, if I am missing something. Thanks for your nice blog. Learn a lot about Spark memory management from your blog. But there is still one problem here. About the parameter spark.memory.storageFraction, I think it’s the least fraction for storage memory, from this post http://spark.apache.org/docs/1.6.0/tuning.html#memory-management-overview, but in your article, storage memory can be lower than this threshold? Can you elaborate about the user space memory like what is the specific operations we do there ?